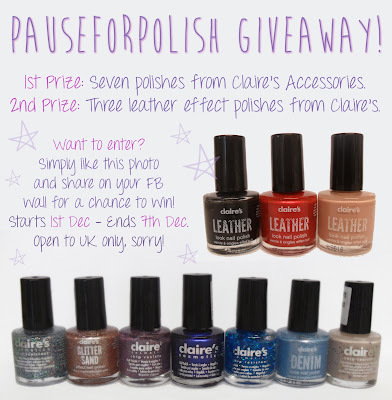 Pause For Polish: GIVEAWAY TIME! ..As promised, it's giveaway time! This is my first giveaway and i'm just a teensy bit excited :) Time for the details! I'll be running this on my Facebook page and it's open to anyone in the UK. It will run for a week, starting today and ending on the 7th. To enter all you have to do is like and share the photo on your FB wall (or blog). There's a first and second prize.. 1st is seven random polishes from Claire's Accessories, and 2nd is three leather polishes from Claire's as well. 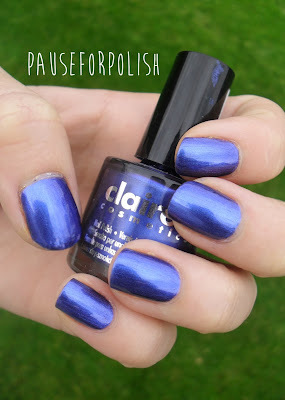 I love Claire's Accessories polish (and not just because i work there!) so thought it only fit to use them in my first giveaway. Plus i already have a few of them myself and have used them in previous looks which i'll provide the links for. Click the image below to be taken to the page to enter! Here's a few clearer shots of the polish for you.. The leather polishes are pretty self explanatory so i'll quickly run through the 1st prize polishes from left to right. 1st: A blue based holographic glitter polish. 2nd: A pinky/champagne coloured glitter polish. 3rd: A purple based fine holographic glitter. 4th: A deep metallic bluey/purple. 5th: Blue and green bar glitter in a clear base. 6th: Light denim effect. 7th: A beigey/brown littered with black and white glitter. These all look a lot better in real life, hopefully you're as excited as i am haha! Here's a few links to previous mani's for you to check out the colours, just click the image to be taken to the post..
12DOC Advent Challenge: Santa Baby! 12 DOC Advent Challenge: All Lit Up! 12 DOC Challenge: Christmas Critters! 12 DOC Advent Challenge: Candy Mania!